Christmas at Biltmore: Saturday, November 3, 2018 – Saturday, January 5, 2019; www.biltmore.com; get discounted daytime admission tickets with the option to add a Christmas Candlelight Evenings tour of Biltmore House when you stay at the Inn on Mill Creek, and your ticket will also be good for the following day at no extra charge. Winter Lights at the North Carolina Arboretum: Friday, November 16 – Monday, December 31; www.ncarboretum.org. Winter Wonderland at the Grove Arcade in downtown Asheville: Friday, November 16, 2018 – Sunday, January 6, 2019; www.grovearcade.com. “Deck the Trees” display with “There Are Angels Among Us” decoration competition at the Monte Vista, 308 W. State Street in Black Mountain: November 30, 2018 -January 6, 2019 (daily 10:00 am – 9:00 pm). Vote for your favorite tree by making a cash or check donation in the box at the tree you choose, with 100% of donations going to Swannanoa Christian Ministry’s Fuel Fund. Prizes will be awarded on December 19. National Hammered Dulcimer Champion and local musician Joshua Messick’s “Hammered Dulcimer Christmas Volume II” CD release concert will be held on two dates at White Horse Black Mountain, 100c Montreat Rd: Friday, November 30 AND Friday, December 7 (8:00 pm) Tickets are $18 advance, $20 at the door: www.whitehorseblackmountain.com/2018/11/joshua-messick-cd-release-of-hammered.html. 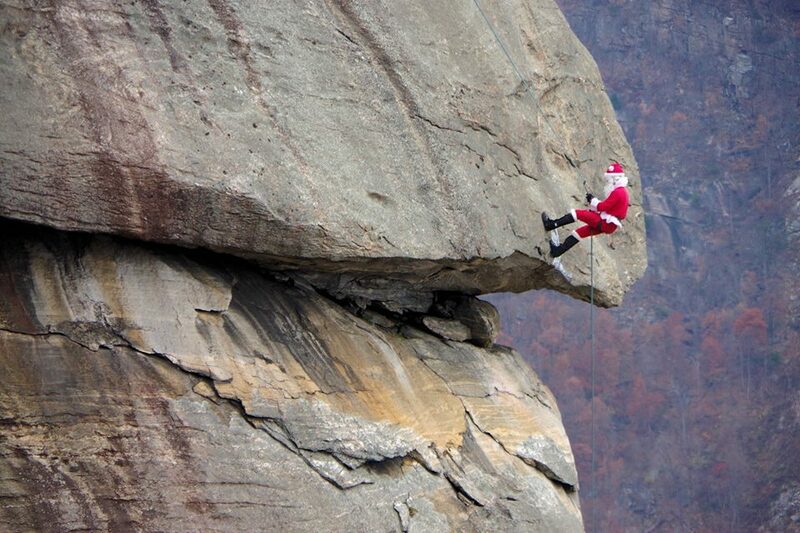 Santa on the Chimney at Chimney Rock State Park, where Santa will be practicing for the big day by rappelling down the granite monolith known as the “Chimney” with the help of elves from Fox Mountain Guides; hot cocoa and cookies will be served: Saturday, December 1 (11:00 am and 2:00 pm); www.chimneyrockpark.com. Holiday Sip and Shop at Grovewood Village adjacent to Omni Grove Park Inn, offering complimentary wine, warm cider and cookies while you shop for unique gift items: Friday, December 7 and Saturday, December 8 (10:30 am – 5:00 pm); www.grovewood.com. “Holly Jolly ‘It’s a Wonderful Life’ Downtown Celebration” in downtown Black Mountain, with shops open late offering refreshments, along with entertainment on the streets of “The Little Town That Rocks” and a visit from Santa: Friday, December 7 (5:00 pm-9:00 pm). Marion Holiday Pop-Up Shop at Mica Town Brewing, with local vendors offering items to help you check off your Christmas shopping list: Saturday, December 8 (12:00 pm – 3:00 pm). Ballet Conservatory of Asheville presents “The Nutcracker” at the Diana Wortham Theatre in Asheville: Thursday, December 13 (4:30 pm and 7:30 pm), Friday, December 14 (4:30 pm and 7:30 pm), and Saturday, December 15 (10:00 am); www.dwtheatre.com. Moscow Ballet’s “Great Russian Nutcracker” at the US Cellular Center’s Thomas Wolfe Auditorium: Sunday, December 16 (3:00 pm and 7:00 pm); www.nutcracker.com/your-city/get-tickets/asheville. “A Swannanoa Solstice” at the Diana Wortham Theatre in Asheville, featuring award-winning recording artists and multi-instrumentalists Al Petteway, Amy White, Robin Bullock, and Grammy-winning special guest David Holt, along with Phil Jamison and Ellie Grace, E.J. Jones and his band, and host Doug Orr: Sunday, December 16 (2:00 pm and 5:00 pm); www.dwtheatre.com. “Dinner with Dickens” dinner theater performance at The Red Rocker Inn: One-man storytelling theater production of Charles Dickens’s “A Christmas Carol”. Tickets are $65 and include prime rib dinner, gratuity and show. Call 828-669-5991 to make a reservation; Tuesday, December 18, Wednesday, December 19, Thursday, December 20 and Friday, December 21. This entry was posted in Asheville Festivals and Events, Black Mountain Festivals and Events, Marion Festivals and Events, Old Fort Festivals and Events and tagged Christmas, festivals and special events, holiday events, Winter by Inn on Mill Creek. Bookmark the permalink.